Specialists in the commercial and domestic gutter cleaning industry, R&S Industrial Services provides a unique gutter vacuum cleaning service for our clients providing a unique, quick, cost effective and safety gutter cleaning solution. Operating from the ground up, the gutter vacuuming system can reach upto 4 storeys high using the very latest in wireless camera technology. The high powered gutter cleaning vacuum cleans your guttering removing it of moss, weeds, pigeon dropping, leaves and anything else that lands on your roof and ends up in your guttering. 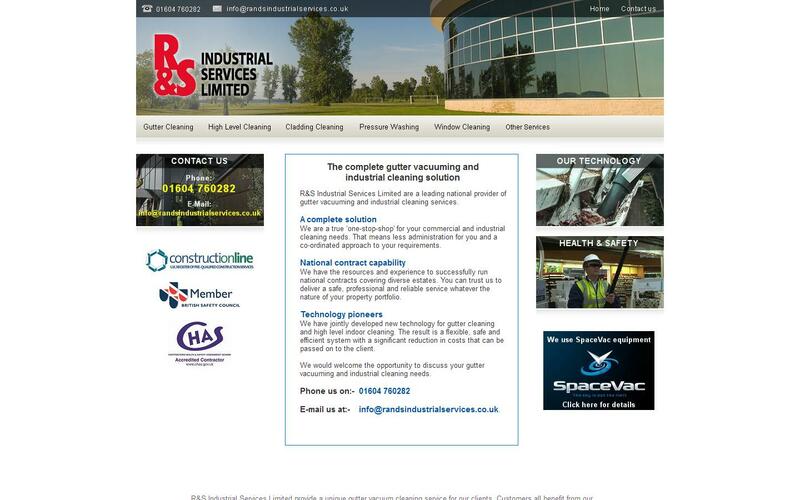 R&S Industrial Services was created by people who have been in the industrial cleaning business for a few years, giving us a vast amount of cumulative knowledge in this sector, both in service and repairs of a vast array of cleaning equipment. This knowledge and experience is put to good use in providing you, our valued customers, with a guttering cleaning service tailored to your requirements and which we firmly believe is second to none. Due to the unique solution that allows the operator to work and clean your gutter safety from the ground up – to meet with the increasing health and safety legislation, and a camera to actually let you see inside the gutter we have been able to serve both our commercial and domestic customers. The 4 storey gutter cleaning systems ensures our commercial customers benefit from not needing to hire cherry pickers and licensed operators or even scaffolding that can takes week to erect or tear down. Our customers range from owners of private properties, retail parks, block management companies, and letting agents. It is with pleasure, as given the opportunity, that we can supply this reference on behalf of, Guttering Vacuum Ltd.We have had the benefit of Mr Bennett and teams expertise over the last year on various jobs and they have shown their ability to perform their duty with expert diligence. Their high level of commitment, efficiency, cooperation and expertise was well received and we can openly say we are more than satisfied with their professionalism.We intend to keep them on our books as permanent contractors as we have a substantive portfolio! Please feel free to contact us if you require any further information.